Since 1988 the National Center for History in the Schools (NCHS) has nurtured ties between the historical profession and classroom teachers in an effort to improve and enliven the teaching of history at all levels. Through publications, professional development, and community engagement, NCHS links UCLA to teachers and students in Los Angeles and across the United States. We make the best thinking about U.S. and World History understandable for teachers and their students. NCHS has developed a range of publications and professional development programs by working closely with teachers, scholars, school districts, and funding agencies. Now a division of the UCLA Public History Initiative, the NCHS continues to support K-12 teachers through innovative curriculum guides and teaching units available through the NCHS Bookstore. World History for Us All is a free online innovative world history curriculum that offers educators and students a coherent conceptual framework for thinking about the human story from early times to the present. 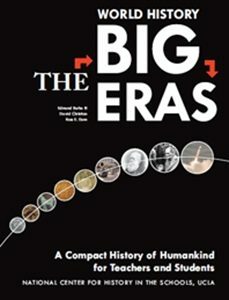 This innovative program is premised on the idea that humankind as a whole has a history to be explored and that classroom world history suitable for the twenty-first century must pay attention to large-scale changes and cross-cultural linkages, not just to the achievements and contributions of different civilizations. The curriculum has a unified chronology, organizing the human past into nine Big Eras, each of them encompassing changes around the globe. 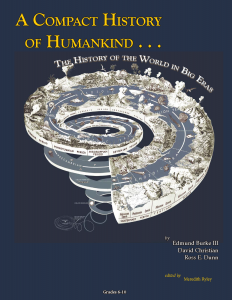 Two companion print publications, Compact History of Humankind and World History: The Big Eras, support and extend the online materials. WHFUA has completely changed the way that I think about and teach world history. Since coming into contact with WHFUA, I have decided to completely recreate my curriculum to identity with WHFUA goals and themes. The themes have helped my students become better historians while participating in my classroom lessons, discussions, and projects. Since implementing WHFUA concepts, my students have been able to create and participate in more complex projects and seminars. WHFUA has had a major impact on my teaching and that of my department. WHFUA is the blueprint for any course that is genuinely World History. It can provide the foundation for individual units, or foundation for the whole spectrum of the course. These are primary sources and strategies in which to use them. Vital resource for any World History teacher. The development of the History Standards was administered by the National Center for History in the Schools at the University of California, Los Angeles under the guidance of the National Council for History Standards. The standards were developed with funding from the National Endowment for the Humanities and the U.S. Department of Education. These 1996 revised history standards were the result of nearly four years of intensive work by hundreds of gifted classroom teachers of history; of supervisors, state social studies specialists, and chief state school officers responsible for history in the schools; of dozens of talented and active academic historians in the nation; and of representatives of a broad array of professional and scholarly organizations, civic and public interest groups, parents and individual citizens with a stake in the teaching of history in the schools. To learn more, please follow the link to History Standards or use the menu on the left hand side.